FIRST – to declare who He is – God’s own Son. 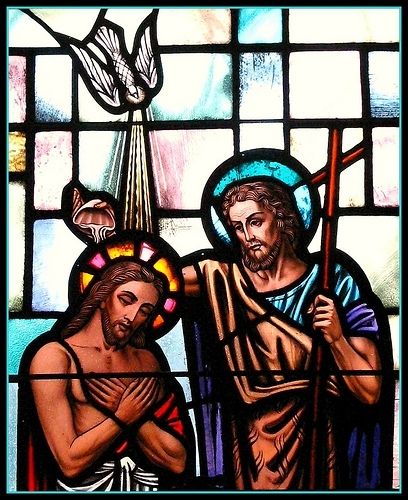 -After Jesus is baptized, the Spirit descends like a dove upon him and a voice from heaven announces who he is: THIS IS MY BELOVED SON. MY FAVOR RESTS ON HIM. First – it proclaims publicly our identity as adopted sons and daughters of the Almighty Father and as temples of the Holy Spirit. Second – it empowers us to do good as Jesus did …..
Our baptism is not an action that happened in the past. Although few of us can remember our own baptism, most of us were carried to the baptismal font as infants in the arms of our parents. What started at our baptism should not be left behind us. Let our baptism become an operative power in us impelling us to do God’s will—to go on a mission. Here is an invitation: renew your baptismal vows today…. From now on WALK INTO A NEW DIRECTION, DE-PROGRAMS YOUR LIVES according to the Gospel Values. – As you do God’s will in your life , you may never see any dove or hear voices approving you good works but always remember that God rewards every good deed!!!! ← Pointless points . . . .